We had a really nice weekend, though baby Steven was still under the weather. 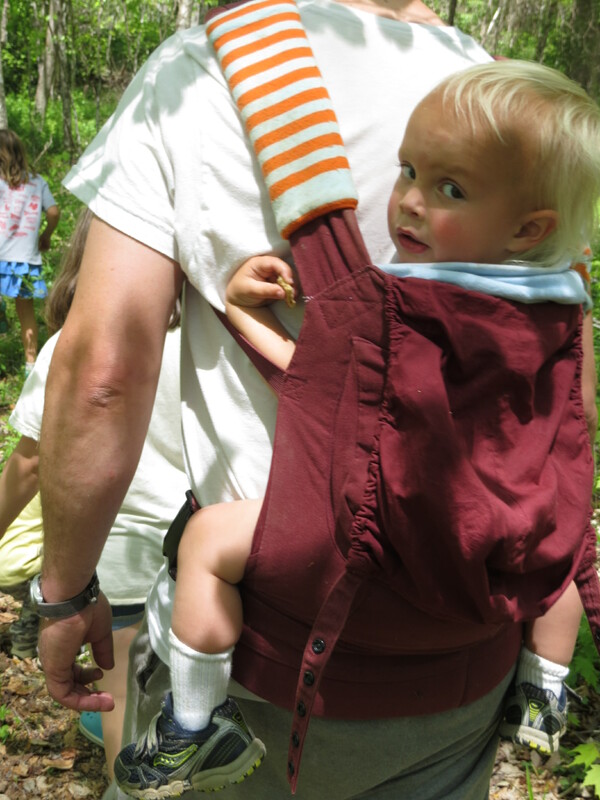 He rallied a few times, but spent most of the weekend in mama or daddy’s arms (or on our backs). 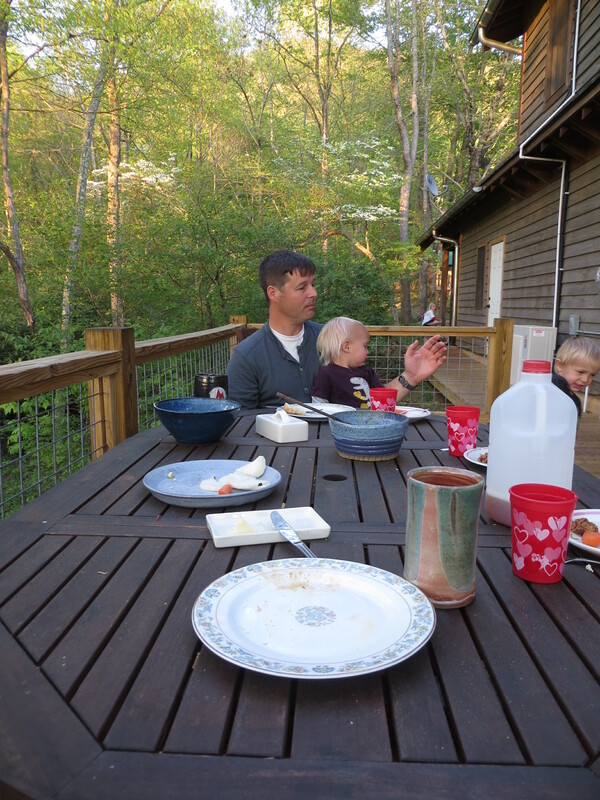 The weather was beautiful and warm all weekend, and we got to eat our first meals of the year on the porch. Somehow, eating outside is more relaxing. 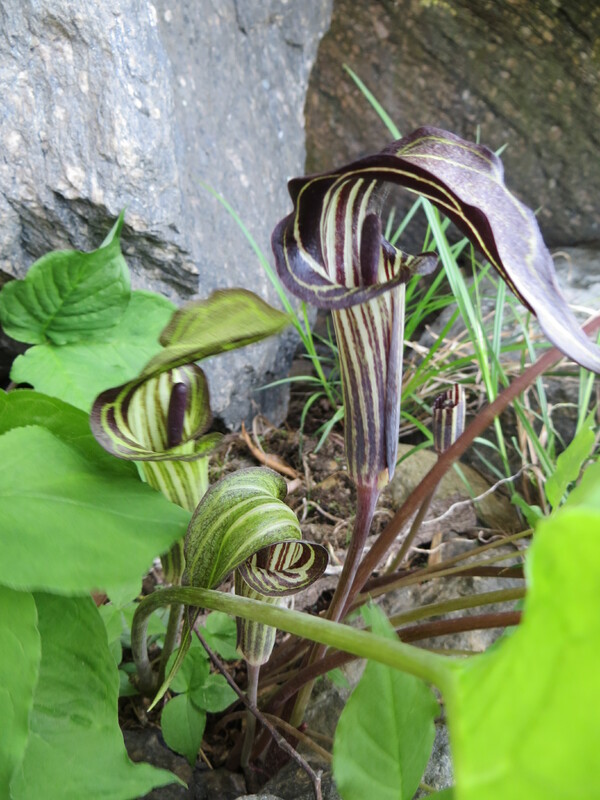 We eat in the shade of new leaves, surrounded by blooms with gentle (usually) breezes. Right now, there are no insects to bite our legs either. 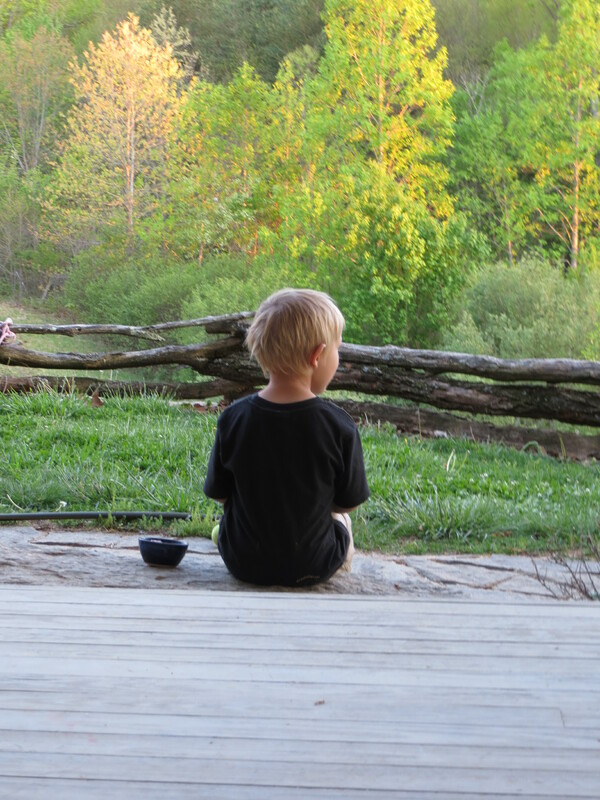 Also, we don’t seem to mind when children jump up to look over the railing at trees or birds, or if someone leaves mid-meal to ride their bike up and down the porch. We just sit and enjoy the time. I really love it. 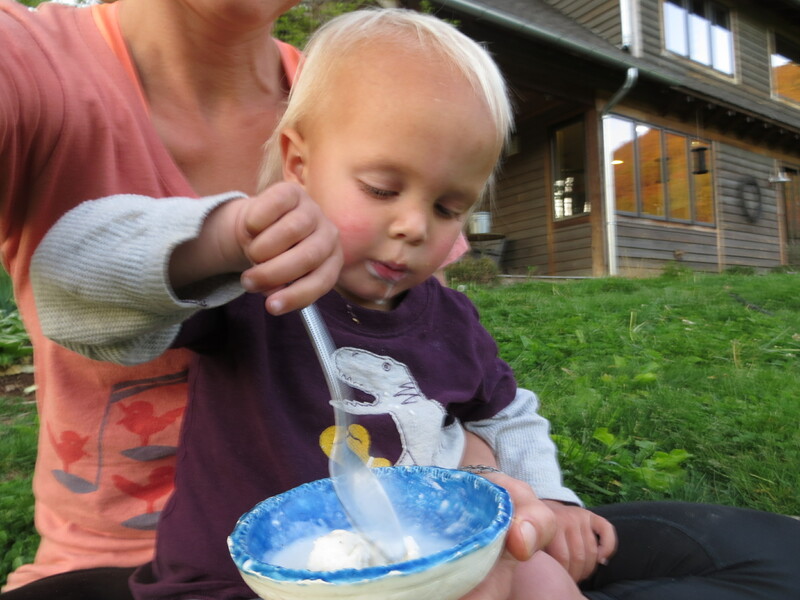 Ice cream on the porch is great. 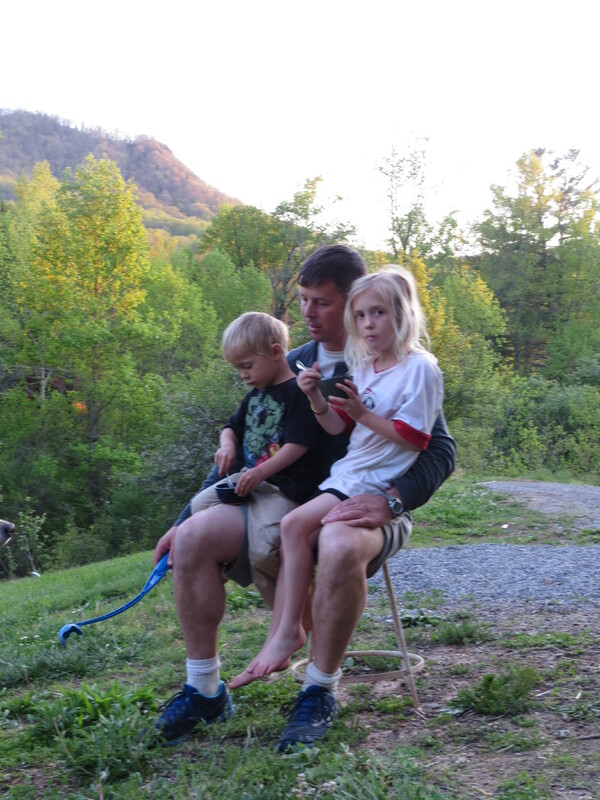 Ice cream in mama or daddy’s lap is even better. 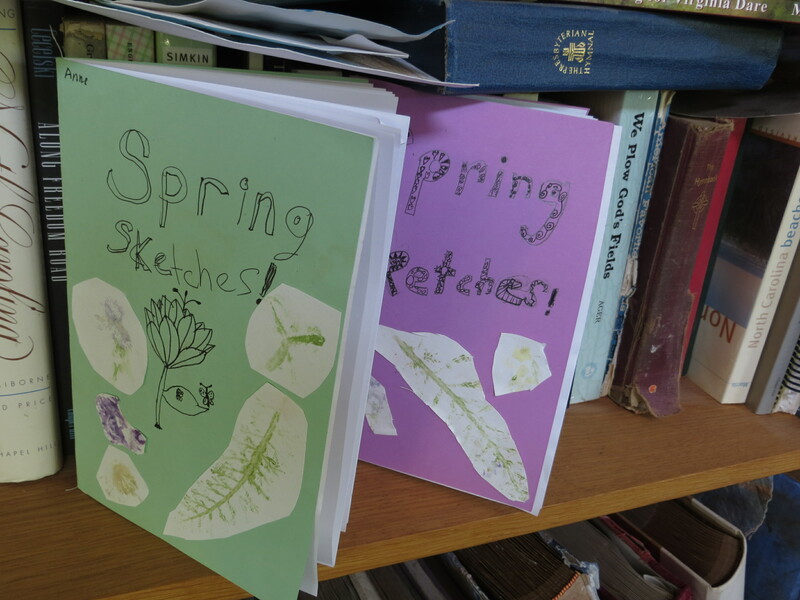 The older three children made sketch books on Saturday. I sewed paper together and they designed the covers with plants they stamped on to watercolor paper. Hythe did not want anything on his cover, but he did fill two pages with drawing of pear and apple tree saplings. 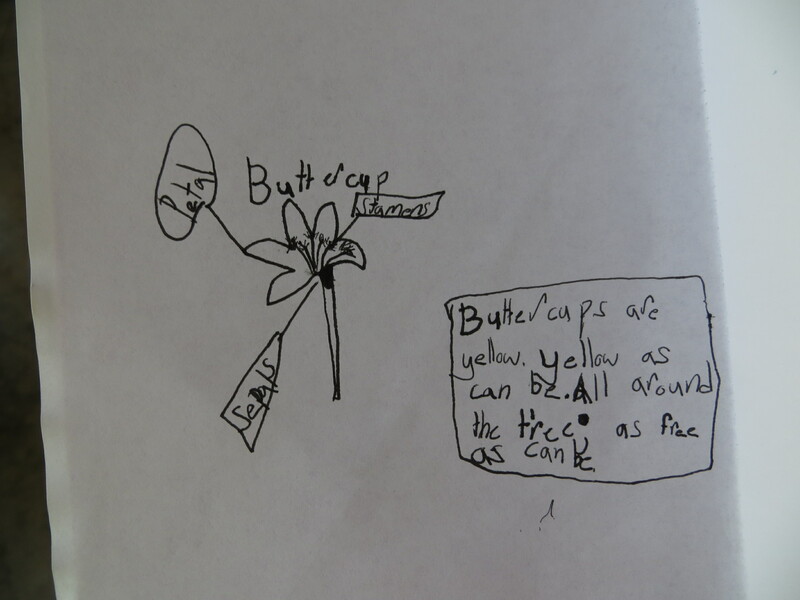 Anne and Evva drew a few flower they found outside and we had a good time identifying the parts of a flower. Despite my degree in biology, I got pistil and stamen mixed up for a few minutes and thoroughly confused Anne. 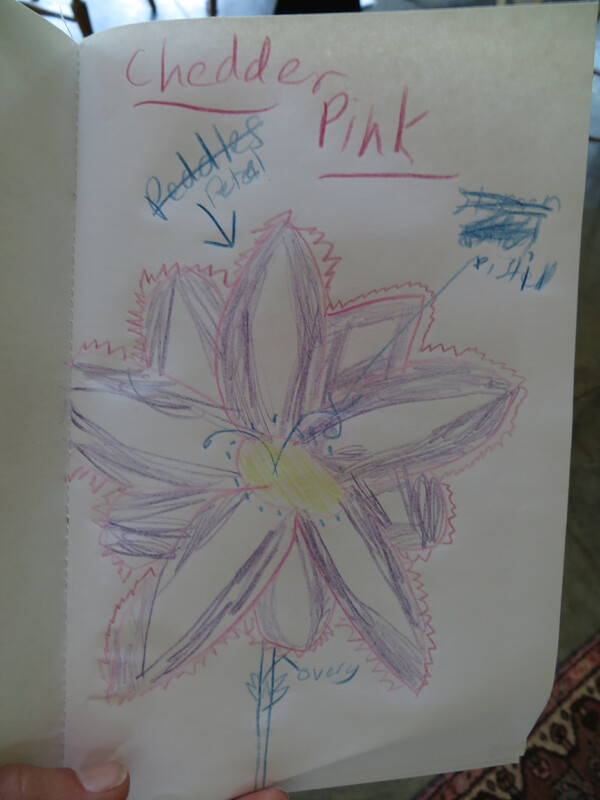 Evva even wrote a poem for one of her flowers. This was a fun project. 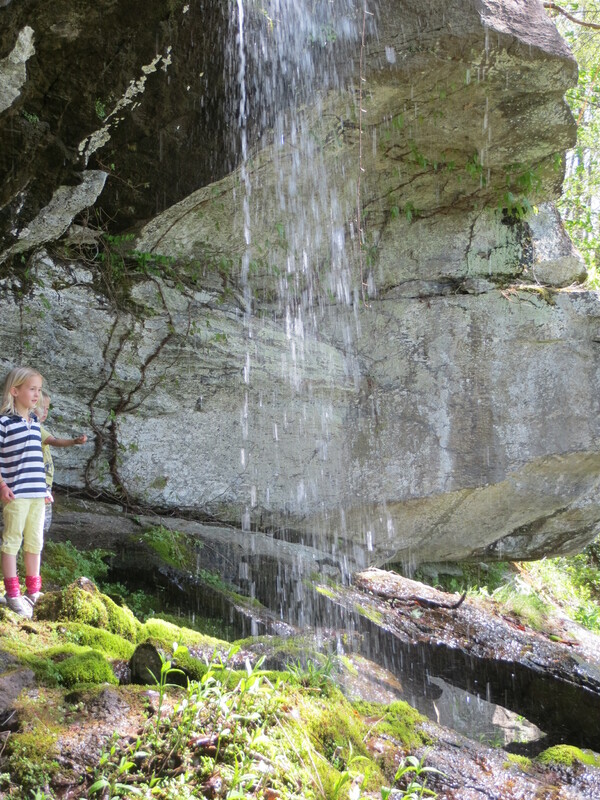 On Sunday, we took all the children, and a few of their friends, on a hike up to the waterfall above our house. 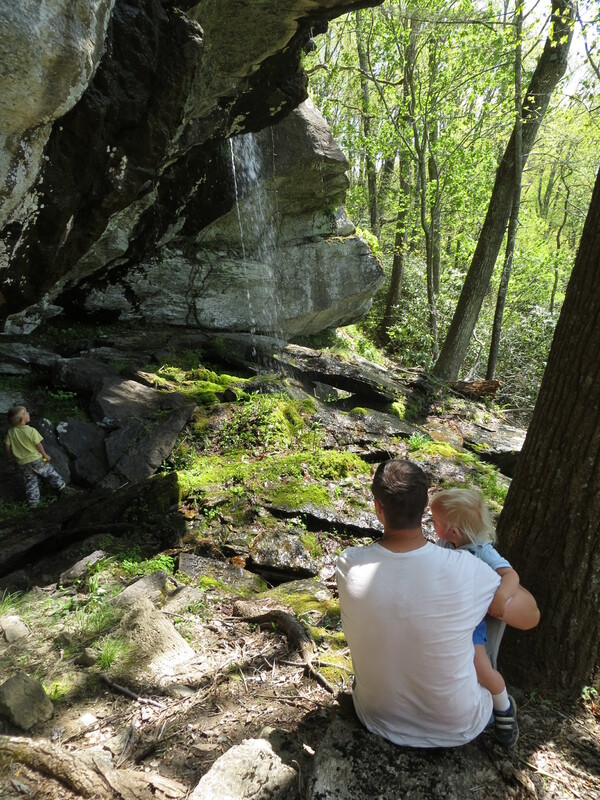 Hythe has named it the “Frozen Waterfall”, because as he says, “that’s its name even when it is not frozen.” We saw a few wildflowers and a beautiful view at the top. 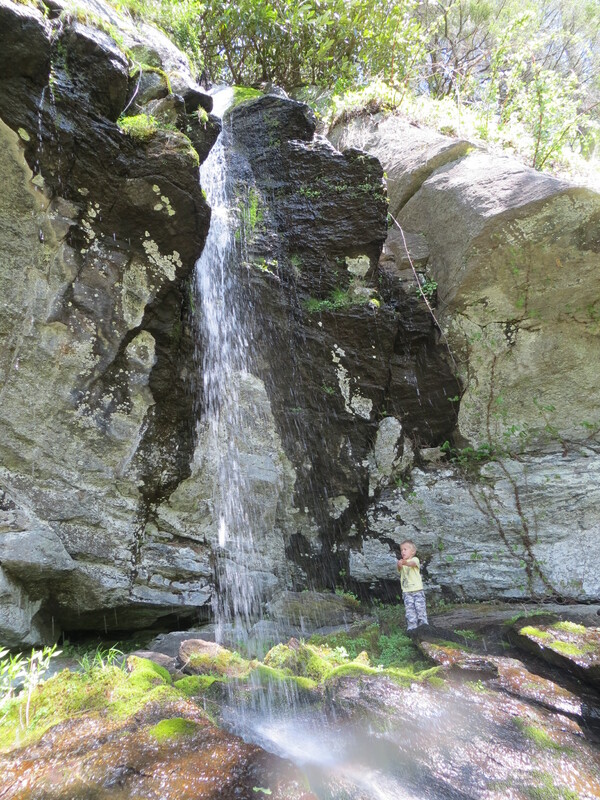 The children cooled off in the dripping water at the top. 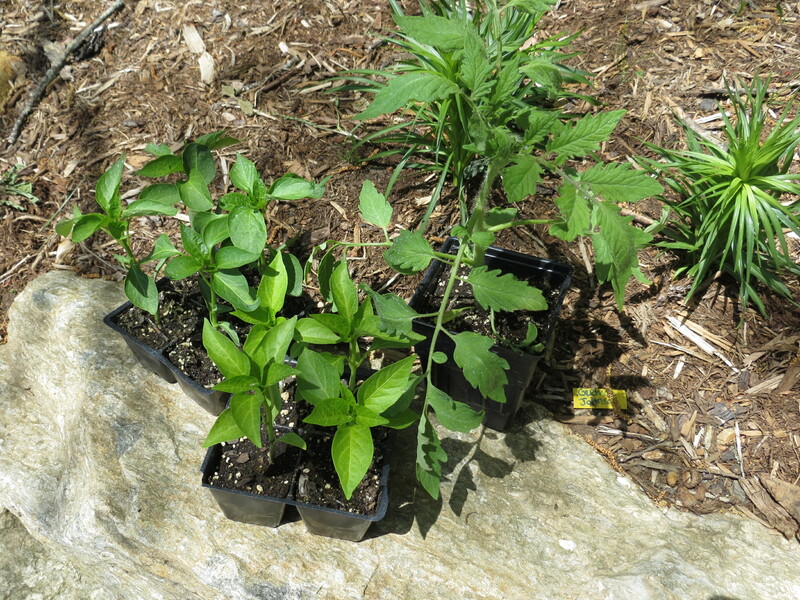 I also snuck off on Sunday evening to get a few tomato and pepper plants (from my sister- and brother-in-laws’ farm) because it is so warm I think I could plant them this week in the garden! Hope your week is great. Our has started a little rough, with a visit to the doctor with the boys and diagnoses of “strep throat” for one and “I don’t know what is wrong with him, but he seems to be getting better” for the other. Just stopped by via soulemama. I hope your week gets better! We also had a little trip to the doctor this week. I feel your pain. Lovely photos!